Think about what happened in still images. That penetration took a bit longer but it was just as complete as sensor technology, digital image processing and storage had to mature. By the time folks were ready to go digital in film, that infrastructure was in place. Consider that cost of a roll of film (36 images) was ~$5 and at least $3.50 for prints, you were spending nearly a quarter per print, good or bad photos, and it took a trip to the store to drop it off and pick up (unless you wanted to pay more for 1 hr developing). Additionally, it was a wet process, it was difficult to change the film and the film could easily be damages if you were not careful. Today, you can buy a 32 GB memory card for $40 and if you save images at the highest resolution in raw format you can get more than 1000 images on the card, you can delete the ones you want, reuse the card after the images are transferred and if you want prints, pay a dime but only for the ones you want. Sensors can capture light with sensitivity equivalent to ISO 128,000 and film is terribly grainy at ISO 1600. So film is more expensive, slower to process as its done chemically, uses precious metal emulsion on the surface, and has less light sensitivity. It's amazing film lasted as long as it did. The enormous advantage with digital photos is that where you used to take 36 images you now take 360, and even if the median image isn't as well composited as before because you're not painstakingly setting up every shot, the top decile of images are way better than the 36 you would have taken before simply due to selection bias. With film you don't really get that, do you? Are filmmakers shooting ten times more footage than they used to? The cost advantage for what they do shoot is probably staggering though. There's a reason why every house had a film-based still camera but video cameras didn't start to penetrate until they could record to magnetic tape. 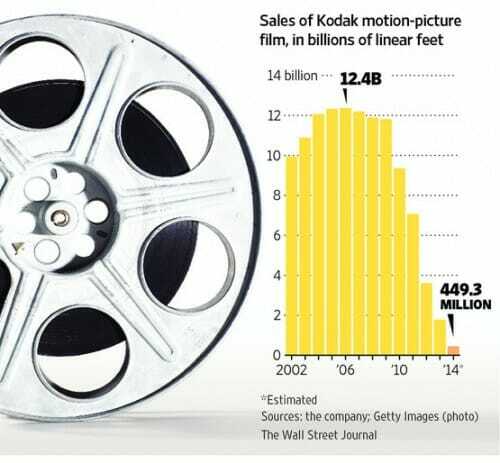 Well, this graph certainly brings memories back for me, around the early to mid 1990's I had a business packaging rolls of film for 2,000 mini-labs all around the country. We did some on going calculations attempting to predict when digital cameras would crater our market. We leaped at an opportunity to sell the business several years before our projected demise. Shocked and amazed to find out that the market disappeared less than a year later. Exponential changes are excruciatingly difficult to predict! Several years ago, I read somewhere that once the sensors got to 8 to 10 megapixels they had the same resolution as 35 mm film. We're now at the point where we're getting the same resolution in pro DSLR's as large format film. And when you consider all the in-camera image processing plus all the things you can do with Photoshop and its competitors, the demise of film is no great lose. You may be old enough to remember when TV shows started using tape rather than film for special effects. The change was forced on theater owners. Probably not a problem with your MegaMall MegaPlexes but this has shut down more than a few small town theaters, because of the cost to convert. Right. The digital technology has spread (proliferated?) the use of the visual medium exponentially...something which film could never achieve. The range of quality is tailored to the application (i.e. low quality cell phone cameras to respectable 3MP point and shoots to "affordable" DSLRs capable of shooting HD movies http://forums.skateperception.com/index.php?/topic/295683-list-of-movies-that-dslrs-have-been-used-in/ ).,,Even allowing videoing in places previously unreachable for the average consumer...shark attacks swimmer https://www.youtube.com/watch?v=-m3N_BnVdOI . It costs me $25 per year for the cloud storage for all my pictures though. When we used film we were more careful. Now we snap at anything and worry about deleting it, good or bad so we end up with 1000 pictures per year vs a shoebox being all the pictures from a lifetime. I now have trouble organizing them all. "I read somewhere that once the sensors got to 8 to 10 megapixels they had the same resolution as 35 mm film." This is not strictly true. The grains (the photo sensitive element of a film) are not all one size nor are they distributed perfectly evenly over a negative, so straight forward direct comparisons of resolution are not possible. The speed* of the film also matters. Slower films that would be used for portrait or landscape photography have smaller grains and so more resolution than faster films that would be needed for photographing moving objects or low light. I also think you don't know what large format film is. A 2 inch square negative like a Hasselblad is considered medium format. Large format would be something like the old style cameras that took 8 inch glass plates. * Film speed is a measure of photo sensitivity. Slow films need either brighter lighting or longer exposures than faster films. Digital is much better for post-production. Think of all the work that is done applying filters and splicing things together. You can do it on a computer at interactive speeds, and then hit "render" to produce the high resolution version. The same thing has happened in audio, by the way. Recording goes straight to digital, gets post-produced in something like ProTools, and then gets shipped to the customer over the Internet. Archives are now saved on hard drives in a server room, rather than on meticulously labelled tapes and CDs. For movies though - most are 35 mm some are 70mm and a handful are IMAX. Going to the theater to see curious George doesn't really compare against 8" film either. Actually IMAX uses standard 70mm film stock, but oriented horizontally rather than vertically, so the 70mm becomes the height rather than the width of the frame. True, but the comment I was replying to was talking about still cameras.